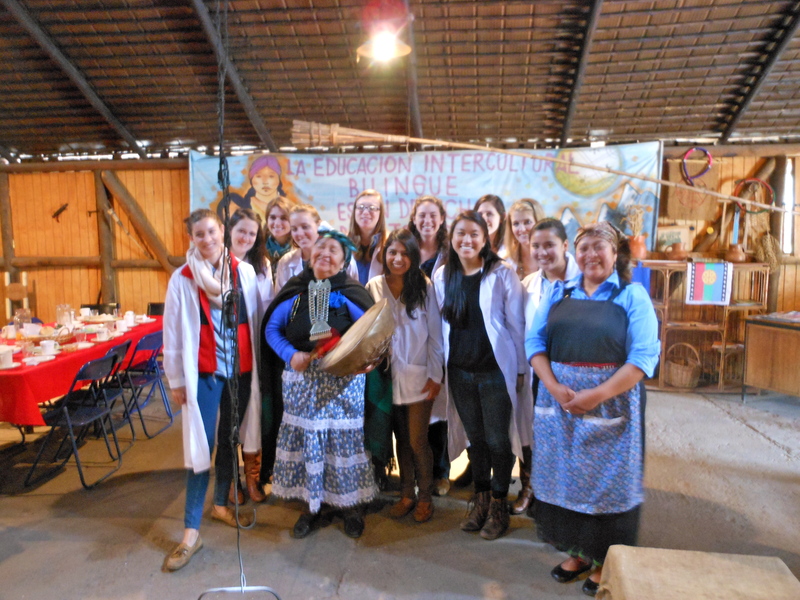 One of the biggest reasons I chose the program here in Santiago, over any other program in the world that Puget Sound offered, was because they have a class called Observación Clínica where I would have the opportunity to shadow and observe doctors in the Chilean health system. Because I want to become a doctor this seemed like the perfect opportunity for me to gain more experience and also learn about the health care in another country. Eventually I would like to work in other countries and try and develop their health systems or offer health attention to those that don’t have access to healthcare. Thus, the opportunity to explore another country’s health system seemed like the perfect way to see if this is really what I want to do. Well, we were in a classroom for this course until about 2 weeks ago. In the classroom we were learning about how the health system works in Chile and how it is different than the system in the US. The first week of May though was technically our first observation. 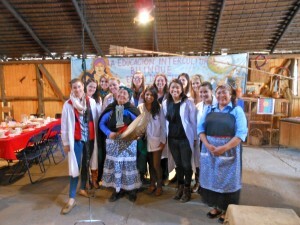 As a group we went to two different sites in Santiago to learn about two completely different areas of health. 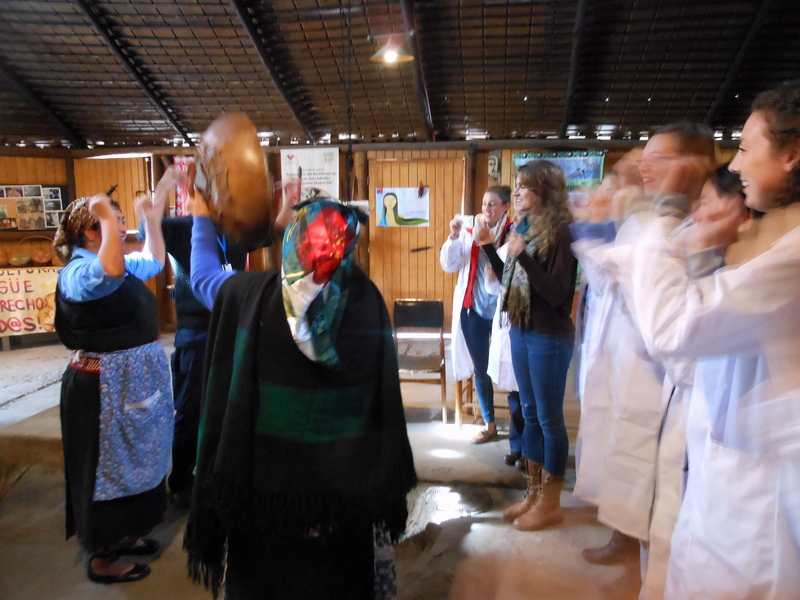 The first place we went to was a ruka, which is a large hut where the Mapuche (the indigenous people of Chile) heal the sick. 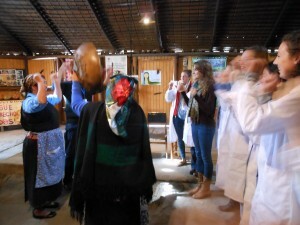 It was a very cool experience to see some of their ceremonies and talk to the Mapuche healers about their struggles with integrating their culture into the more modern Chile. After this, we went to a clinic where patients with terminal illnesses can go to live out the rest of their life in comfort. It is the only clinic like it in all of South America and is totally free to the patients. Overall, it was a rewarding experience getting to talk with the volunteers and nurses about this institute. Although these experiences were very insightful, they left me feeling a little disappointed because I felt that I didn’t get to see as much as I really wanted to. I wanted to see the doctors and nurses interacting with patients, or the Mapuche doing their healing ceremonies, but I didn’t see any of this. For this reason, I was very excited for this last week when I would be in a hospital with doctors. I knew the dynamic would change because we would no longer be in a big group but rather in pairs. However there is an uneven number of people in our class and thus, there is one group of three. I am in that group of three and the professor explained to us that each week one of us would have to go to a site alone. When we were given our assignments for the week, I found that I would be the only person to go to a placement alone. I was really nervous, hoping that I would be able to understand everyone even if I didn’t have another set of ears to help me out. I got to the hospital, which was incredibly nice by the way. I almost felt like I was in the United States again. I was introduced to the head of the emergency department, which was the department where I would be working for the day. The lady gave me a quick introduction to the basics of the emergency room procedures in Chile and then introduced me to a nurse. The nurse introduced me to some of the other staff but because that morning was really quiet, there wasn’t much to do. We sat around for a while and every few minutes the nurse would bring me into a room with him to administer medicine to a patient or one time, to take stitches out. It was an uneventful morning, and although I was starting to observe some doctors, which is exactly what I wanted to do, I felt like I needed to make more of an effort to ask questions of the staff in order to learn as much as possible. I began to ask how the process of checking in worked and what the layout of the department was. A nurse showed me around and introduced me to all the different types of machines they had. It was starting to seem just like a US hospital. Then she introduced me to one of the doctors in the ER. He told me that he wanted me to follow him into the next room. The nurse at triage would ask if it was okay if a student came in with him and then I could see the whole process for myself. I was stoked. This is exactly what I wanted to see. When the next patient came in the doctor handed me the chart and said something . . . Did I understand that right? I thought he had told me to go into the room and ask the patient for their symptoms. This couldn’t be true though. He was coming with me right? When I went over him again, he just looked at me and asked if I’d done it yet. “Done what?” I asked. “Asked the patient for their symptoms.” So I had heard him right. He was asking me to go into the room, without him, before him, and ask the patient how they were feeling that day. Wow, this was scary. I’ve done Global Medical Brigades before, where a group of students from Puget Sound go down to Honduras and set up a medical clinic for a week, and with this experience I’ve had to ask patients their symptoms and record them. But somehow this felt way different. It was in a much more professional setting and I felt very intimidated to just walk into a patient’s room as if I was part of the medical staff. I told myself I could do it and then walked into the room with as much confidence as I could muster. I asked the patient what their symptoms were and how they felt, praying that I would able to understand their response. Surprisingly I understood EVERY word she said and was able to write on the chart exactly how she felt, what her symptoms were, and when they had started. As I walked out of the room, I was really proud of myself. I went back into the room to observe the consult with the doctor. Afterwards the doctor told me I had done a really good job and made the visit a lot faster for him. He asked me to start going in to all his patients rooms before him and because I did such a good job, he also wanted me to write down any allergies the patient had, any previous illnesses, and the medications they were taking. I felt like a real medical student. After a few hours, the doctor introduced me to another doctor who I could shadow too. This doctor brought me into the room with him and would introduce me as the American from Denver who was learning about the Chilean health system. To my great surprise, in the first consult that I sat in on with this doctor, he told the patient that I had some questions for him about the Chilean health system. He then abruptly left the room, leaving me alone with the patients with absolutely no questions to ask. I was terrified but I had to think of something to ask. I couldn’t just leave. I asked him how he liked the service he had received that day. After asking one question, I felt a lot more comfortable and began to see this impromptu interview as an opportunity to see the opinion of the health system of Chile from the perspective of an actual patient and not from a doctor or professor. I ended up talking with the patient for about 40 minutes and we talked about so much—from the Chilean health system to American politics. For having no questions prepared I again felt proud of myself that I was able to communicate with a native Chilean with no help and learn a lot of new things about the Chilean health system. Over the course of the day I continued to ask patients their symptoms, observe other simple medical procedures, and had the opportunity to “interview” patients about their experience with Chilean healthcare. Overall, it was an amazing day that instead of leaving me disappointed like the week before left me wanting to go back. While at the beginning of the day I was fairly shy and still nervous about being by myself without a classmate, I learned at the end of the day that I would not have wanted it any other way. Being by myself made me feel more independent and I think I got more out of the experience than if I would have had another American with me. I learned how to push myself out of my comfort zone and take initiative. If I hadn’t taken initiative and asked questions and done some of the scary things the doctors asked me to do (like take notes on the patient’s symptoms and interview them about their health system) I wouldn’t have learned as much. After the day I asked some my classmates how their days had gone and most of them told me that they didn’t really enjoy the experience. They were left feeling disappointed and that they didn’t get to see anything super cool. While I didn’t get to see anything that would change my life forever, like someone brought back to life or even a cast put on a broken arm, I learned so much about the Chilean health system, and better yet, myself. I learned that I need to put myself out there, push myself beyond my comforts in order to advance my learning and myself. Overall it was an amazing experience and I can’t wait for this Thursday when I will get to observe surgery and learn more about myself.